I spend a lot of my time reading product reviews, true crime books, children’s magazines and actually kind of testing out products, mainly kid’s stuff, because yes, I have the time. (I know how some of you just hate that but I don’t care, it’s true). I’m also a bit of safety nut as I’ve discussed HERE and HERE. I've also written about some of my favorite baby proofing tips. But now I think I’ve found a truly remarkable product. Truly remarkable if the seller has actually sold any. Frightening actually. It’s the Bumper Bonnet by One Step Ahead. 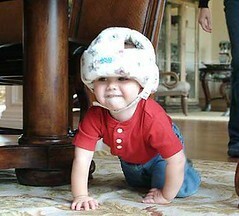 Now I just know some neurotic nutcase safety-conscious parent like me has bought one of these. Now, I just ask that you identify yourselves as I want further proof that there are crazier people out there than me. On One Step Ahead’s website there are three positive reviews for this product, which I’m going to assume were written by the manufacturer’s friends. Plus, I truly want to know how many of these freak hats have been sold because I swear to you if ANY have been sold, I WILL create some stupid product to sell so I too can make money. Good lord!! It's on backorder! Must be lots of people just dying to have one. That has got to be one of the craziest things I've ever seen. I'd love to hear from someone who actually bought one. But what about baby's poor little hands on those rough hardwood floors? When are they going to start selling a matching set of safety mits? I want one. For my own noggin. The hardwood floors are unbearable. So funny you mentioned this. Andrew handed me the One Step ahead catalog with all of the cute Halloween costumes, and all I could see was this nutty helmet. The poor child in the picture looks like he has a full diaper on his head! There are children who do have to wear helmets for real medical situations and it's hard enough on them socially. Maybe this would be an equalizing factor, we should all get one and take away the stigma!Put all of the neurosurgeons out of business! Hard to believe someone has "out safety'd" the Lucky Mom! I suppose if you have a kid with some sort of disability and falls down a lot, this product could be useful??? Why not invent the entire "bumper-suit" so the kid doesn't get a scratch, bruise, broken bone....EVER. Actually, it looks like the baby is wearing some kind of diaper on his head! Whoever invented that has had FAR too much wine to drink! Ok I think we can "safely" say this product may take baby proofing a little over the edge! I mean why? I guess if the child has previous head injuries or maybe some mental disability this is great for them. (Shouldn't they be available through a doctor?) Also, if your child wears these is it bad for the shaping and growth of their little heads? What if someone (a parent) doesn't monitor it's use properly or puts it on a child that really shouldn't use these type of things? Shouldn't this type of thing be recommended via a physician? And Monitiored by the Physician as well? Frankly, the product scares me just a little. I think it is safe to say I will not be recommending nor purchasing one for my children. ljs - hey, now you might have a money-making scam for me: The Bumper Suit! I love it. Someone stated that "there are three people on One Step Ahead who have given this product rave reviews." EXACTLY!!! You are all knocking something you haven't tried. My daughter is 10 months old and is attempting to stand and walk. We have hardwood floors and she has fallen backwards twice and hit her head. Who cares what it looks like if it saves your child from harm? Within 1 day of buying this, my daughter has been bump free and is freer to mover around without getting hurt. When she has fallen, she just gets up, no crying at all. I also don't have to stand right there nervously with my hands out worrying that she is going to fall and hit her head. Despite your comments, I have been and will be recommending this product to every mother I know. And, by the way, she has the red one which looks far from a diaper. It is actually quite cute, with animal designs. And how is it any different than a bicycle helmet. I'm sure that when they first came out, people were saying the same thing, thinking they looked funny. Now everyone is wearing that weird thing called the bicycle helmet. And what do we say NOW...anyone who doesn't wear one because they want to look "cool" is an idiot by risking their getting hurt. This is no different, and is in fact more important. We are talking about infants here, people!!! Defenseless little beings. Looks like they don't need to grow up as much as you all do. For those of you who think this product is some kind of ridiculous gimmick, if you would open up your little minds and think outside the box for 2 seconds, then maybe you would come to realize that there are children out there with problems such as low muscle tone and very lax joints, like children with Down syndrome, which my son happens to have. Since my son has begun to walk he is still very accident prone due to his condition and this product literally has saved him from countless bumps and bruises on his head. Anonymous - I don't think anyone would ridicule a product that is for children with special needs like you mention. The marketing of this product appears to be targeted to non-special needs children from what I see. Okay...Now I know with my first son I would have said this has to be the craziest product around...but now that my 2nd child is here and hes such a dare devil and we have wood floors I am seriously thinking about getting one..He just tonight slammed his head onto the floor...when you here that hit you just get so sick to your stomach and the fear comes over you that hes really hurt hisself this time...If something like this will help out and save him from hardwood floors then by all means yes I will buy this ! Now if I had carpet floors then no we would be fine. It just looks like a bicylcle helmet that kids and adults wear. I guess if you dont have the hardwoods floors and have never seen a child hit his head like that on them then you would be quick to judge but with my little one here I think we are going to have to take a try at this. If its for his protection while he is learning then by all means YES I will purchase it...I mean we put protective things on our kids when we are teaching me to ride a bike why not when they walk only if they need it. Its not like I would keep this thing on him 24/7....Open your eyes up to keeping the little ones safe on hardwood floors...we cannot be there every second to keep them from falling. I'm about to buy one as well. Solely because of our hardwoods & the force with which my daughter hits her head on them. My 9-month-old bumps her head on them about twice a day, when she slips from either a crawling or pulling up position. Makes a horrible noise & she cries (unlike when she falls on our carpet). I never got anything like this for my son since he didn't move around & fall as much as his sister does. We've just had one head bump too many - we want to do something to prevent further ones. comments: For some reason I cannot post a response to your bumper bonnet post but I wanted to email you to say that I was definately with you on this one up until this past week.We have hardwood floors throughout our house. Baby is 9 months old, just pulling up and and starting to stand.In less than a week she has managed to smash her head on the floor or fall off of something 4 times.She has a purple and yellow black eye and several bruises and I am sure one hell of a headache.I would love to send you a picture of my battered baby to prove to you that this product isn't ridiculous or for "freak" parents who are overly cautious. I am definately investing in one for around the house because you cannot imagine the pain a mother feels when she hears her poor baby's head hit the stupid hardwood floor and the blood curdling scream accompanied by it. I would wrap the girl in bubble wrap I feel so bad for her. But maybe I should worry more about what people like you think about me and put my baby's safety on the back burner so not to be made fun of?I don't think you can comment on this until you have had a baby who looks like she has been through a war because of her large-for-her-body head, shaky legs and your hardwood floors. I've used this and similar products for my babies learning to sit and walk on hardwood, concrete, ceramic tile, etc. for 5 years now. -- since the second time I had to take my daredevil oldest in for stitches on his forehead. I've been ridiculed for it, but don't CARE. These products really work, if they are used as recommended. My little guys climb like monkeys and do not get gooseggs and cut foreheads while wearing these. I don't think it is natural to raise children in a world of so many hard surfaces. Since we've paved paradise and put up parking lots and hardwood floors everywhere our children go, I think it is simply good parenting to protect our kids a little when they are prone to falling. Why is it ok to have children wear bike helmets -- or shoes -- or snowsuits -- and not ok to care about protecting their little heads? I have read (when I was researching backyard swingset safety) that a child can die from a fall from 3 feet onto a hard surface. It is easier to protect the little head than to slipcover the house. I could get a few dozen of those off-gassing foamy interlocking mats and cover my house, not to mention lots of corner protectors, etc. or one cotton-covered bumper bonnet. Which makes more sense? And I agree with the poster who suggested that if more of these helmets were around, they would normalize the special needs headgear that some children must wear. If these foam helmets are laughed at for looking like "diapers on the head", how does that help the wearers of very similar looking headgear for seizures, etc to be accepted in society. e ridicule is ugly. How must their parents feel about this? I'd rather raise my boys to wear sunglasses and think their friends' prescription glasses are "cool" than to laugh at someone who wears sunglasses in the playground and call them 4-eyes, to propose a similar example. Dear "Lucky Mom". You must indeed be lucky to have never felt the heartache of having your baby fall and hurt himself. Or maybe your mothering instinct is defective. Either way, I'm happy to have found this product (which I ordered just, and sad to have found your shortsighted forum in my search. Dear "Lucky Mom". You must indeed be lucky to have never felt the heartache of having your baby fall and hurt himself. Or maybe your mothering instinct is defective. Either way, I'm happy to have found this product, which I ordered just a few minutes ago, and sad to have found your shortsighted forum in my search. The Bumper Bonnet saved our 3 boys as we had ancient hardwood floors that were rock hard. We needed them from about 4 months- 14 months. Sorry - just couldn't do the tough love thing for that long. My youngest of 8 grandchildren is quite an active little boy, he was walking by 10 months, running shortly after and had incredible balance, gross motor skills and fine motor skills. Sadly he spent all day in the emergency room last Wednesday from falling on a "Concrete" floor at his aunts house while his parents were visiting. He tripped and fell on the front of his head. My active little grandson suffered a severe concussion, he didn't eat all day, couldn't stand up and just wanted to sleep. It has been 6 days and he is improving slowly, but it is imperative that he NOT suffer any head trauma while healing from the last one. That is the reason I'm buying him a bumper now. We were meant to roam on dirt... not concrete, tile and hardwood. I know Jennifer, the inventor, and supported her product the minute I laid eyes on it. It was a win, win situation for me, because my son was just pulling up and teetering, whacking his head off of our coffee table, and everything around him...this way I protected him, AND I supported a local inventor! All of the disbelievers just have to hope that a severe head injury never occurs to one of their children/grandchildren, or they'll regret their negative words. My mom bought these for my sister's twins tonight online. She has hard wood floors and today when my sister showed up at a birthday party one of the girls had 4 bruises all over her forehead and face. I jokingly told her that she needed my brother's old tae kwon doe sparing helmets for them. She has tried hats and fabric headbands but they always pull each others off. My mom was quite concerned for the girls and tonight I received an email that said she bought bumper bonnets. To say they are hysterical is an understatement! But I hope they do the trick. I'm probably one of the least risk averse parents around. I totally ignore things like food allergies, don't worry if our daughter picks stuff up from the floor and eats it (never did me any harm), and am quite happy to toss her in the air, which she loves (over a soft mattress in case of misses). But I'm seriously considering one of these, because we have a hard floors in pretty much every room, and an adventurous baby. At the moment she's faceplanting on the hardwood at least twice a day, with a sickening thud followed by distraught screaming. I'm seriously considering buying one of these for my 15 month old because he has major temper tantrums, and likes to whack his head on the floor repeatedly to show how angry he is. Today he almost split his head open, and would have if not for the fact that I got to him and stopped him in time.